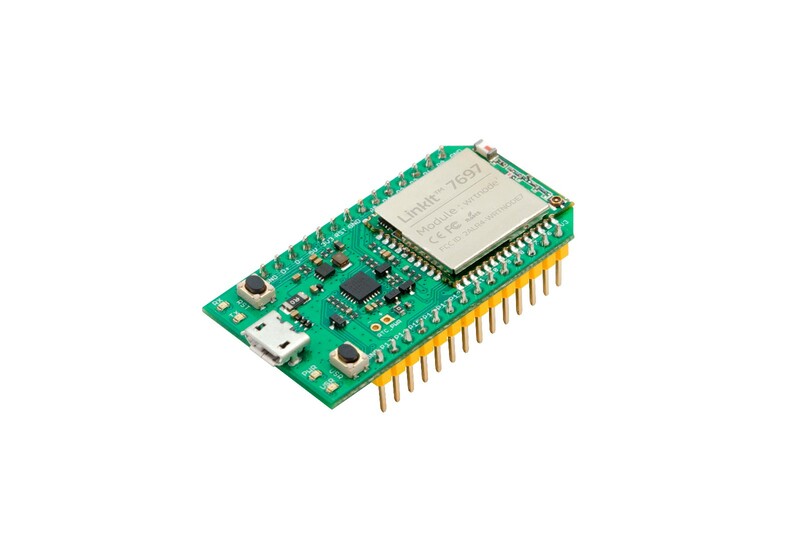 LinkIt 7697is a the latest development board andreleased by MediaTek and Seeed,combined Wi-Fi with low power Bluetooth (BLE) communication technology,mainly used in end point device of the Internet of things applications. 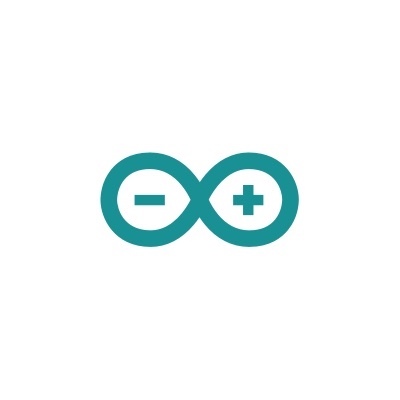 In order to reduce the threshold oflearning and development of maker and beginner, MTK not only developed specifically for MediaTek Cloud System (MCS) Arduino Library, but also released development software BlocklyDuino with MCS function graphical ,it is very suitable for teaching as school networking courses, italso as a IOTdevice forquickly developing the use of MCS . 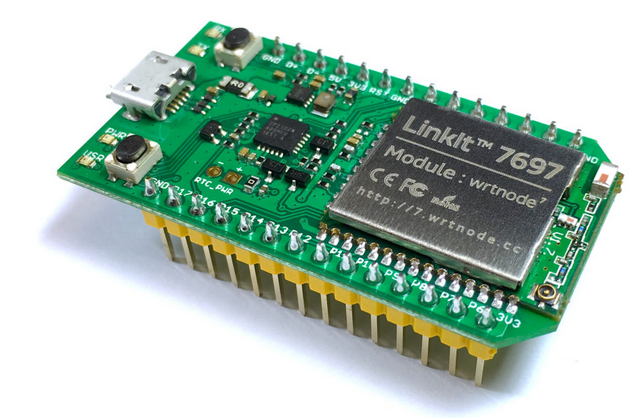 LinkIt 7697 provides a variety of ways for development, the first isthe Arduino development environment, which is continutionof the LinkIt series before, as long as the host has Arduino IDE;Thesecond is GNU environment, which is applicable for using LinkIt 7697 SDK C/C++ to compile the source code, the third is , use visual development tools LinkIt 7697 BlocklyDuino editor,it translates graphical commands into Arduino code, and finallyusingArduino IDE writes 7697 . 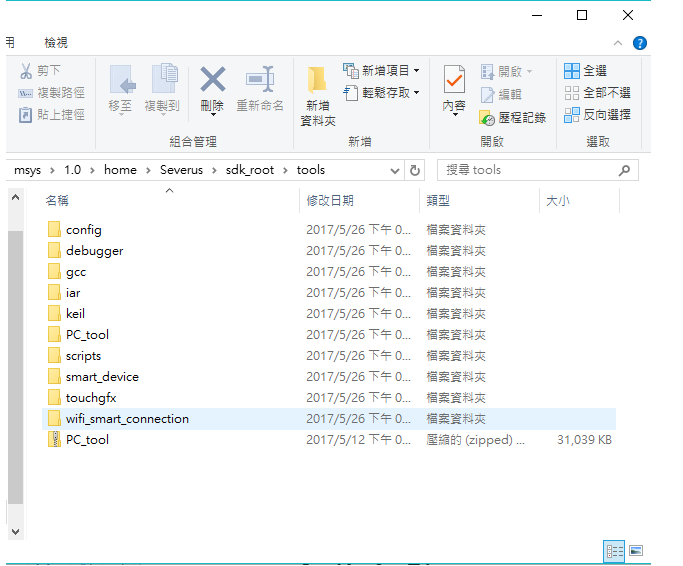 The user can according to their own needs,and then choose which way to develop , we introduce the following installation steps of the development environment, but first of all, please install the good hardware driver. 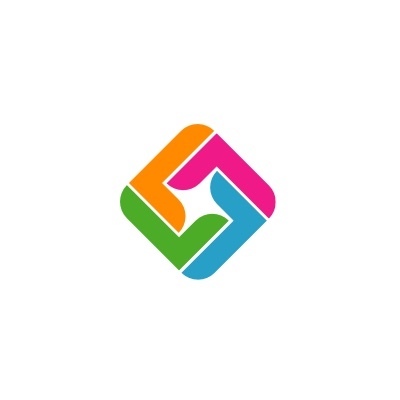 1. access to this connection,according to your operating system to download the driver, We using Win10, Download Download VCP (5.3 MB) (Default). 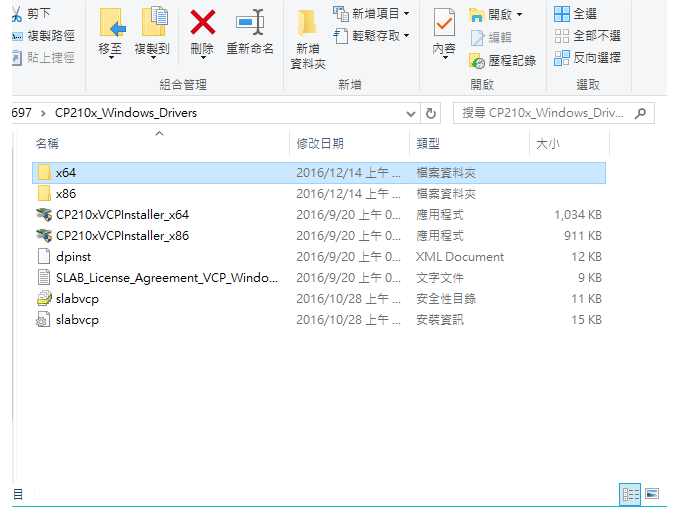 2. extract the downloaded file, according your operating system to install the driver, follow the steps to select (not sure if your computer is x86 or x64, can refer to this article, if it is 32 x86, 64 x64). 3. after connecting the 7697to the computer, enter the console's device manager. If the ports (COM and LPT) have Silicon Labs CP210x.....Bridge, it means the installation is successful. 1. enter the conection, you can select the"support"and"download"on the right or the"download"on the left. 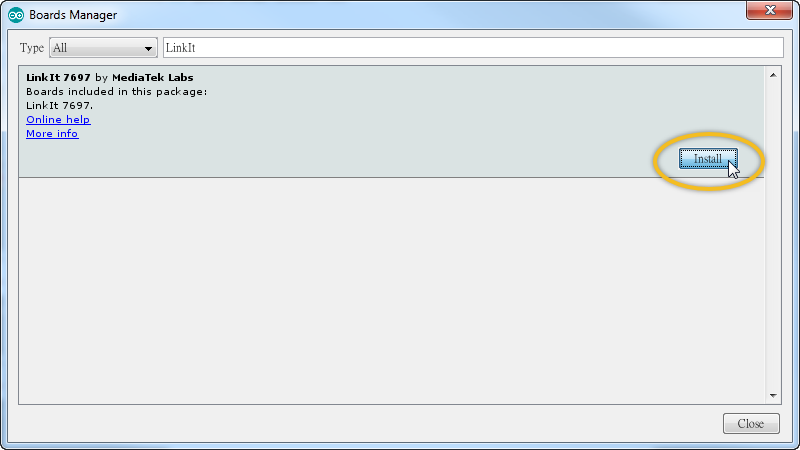 After installing the main program, you can see the picture. 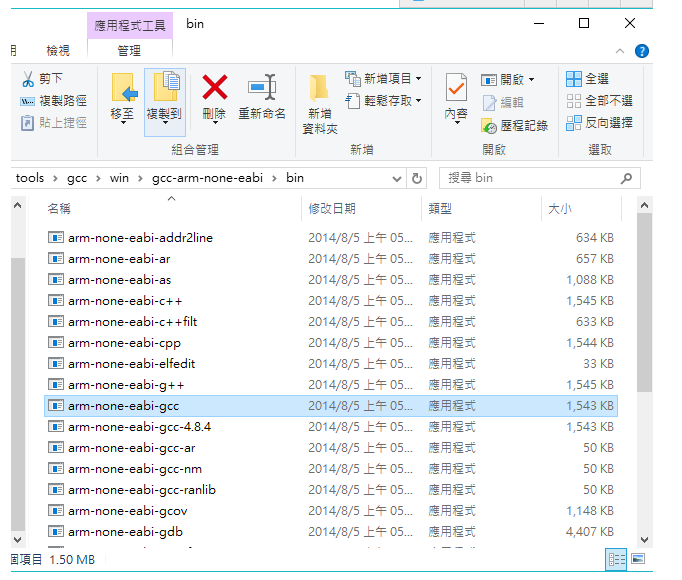 *Maybe you already have installed Arduino IDE, note that the 7697 board officialdemandversion of IDE to 1.8.1, the user run 7688 version of 1.6.5 IDE to install 7697, it failin the process of adding new board, so we recommended that you use the latest version of Arduino IDE to develop 7697. 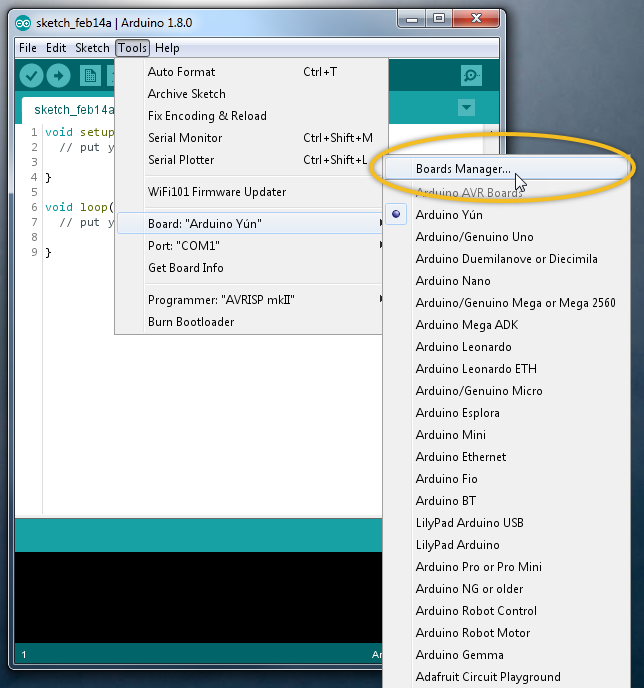 2., Arduino IDE doesn't read 7697 now, so we have to add 7697 of the development board data and click preferences in the top left corner of the file. 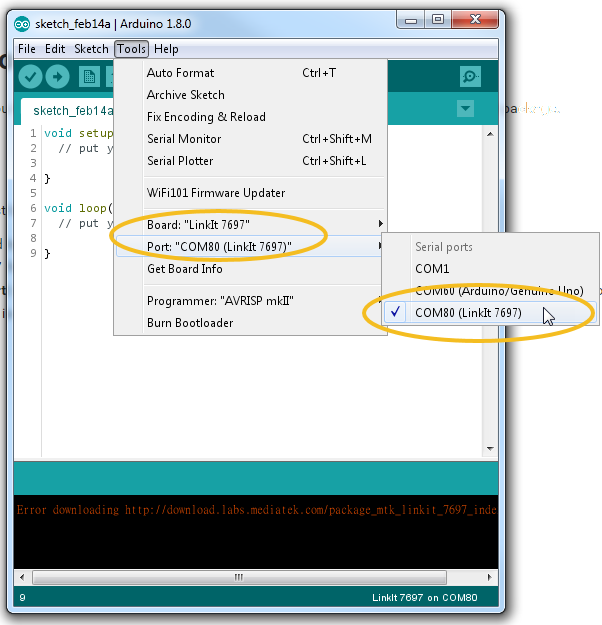 3. below the"additional development board administrator site"field, enter: http://download.labs.mediatek.com/package_mtk_linkit_7697_index.json, press ok.
4. the"development board: Arduino Uno"option in the tools in the upper left corner, select the"development board administrator". 5.When you go in at the first time, it will automatically update the directory and take a little time. 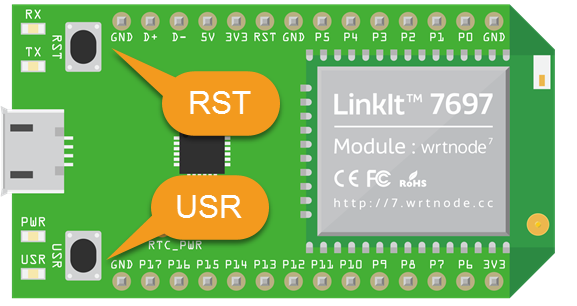 After that, enter 7697 in the top right corner, then click Install, then go back to the development board and select"LinkIt 7697"
6.Connect 7697, click file > paradigm > Basic > Blink, then in the"tool","serial port"click LinkIt 7697 on COM,If the upload is successful, the installation of the Arduino IDE development environment has been completed, and we can see that the 7697 USR LED will slowly flicker. 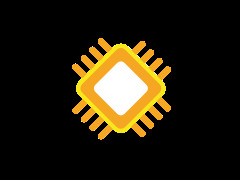 EOwing to 7697 of the BlocklyDuino graphical instructions have the function of linking MediaTek Cloud System (MCS), it is very convenient for developing IOT devices. 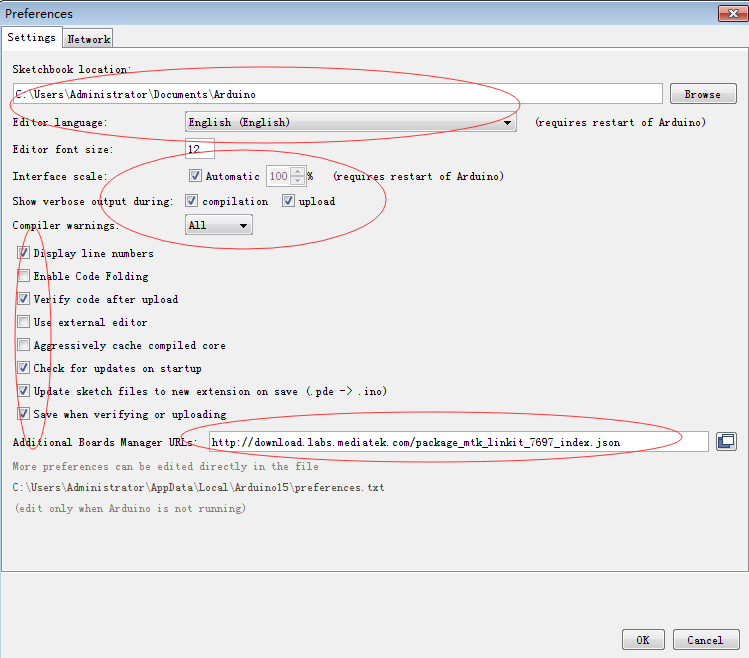 1. download kit from this connection, click “Clone or download”, unzip and downloadedthefile. 3. 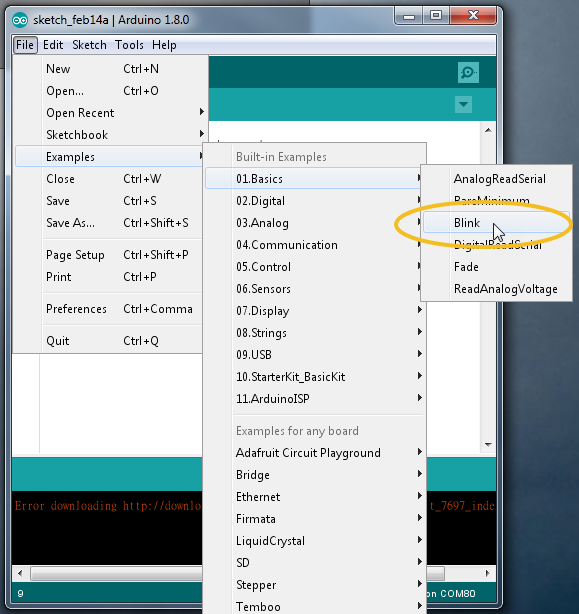 After writing the graphics command, using the top right corner of the storage, the program automatically converts it to the Arduino source code and then using IDE writes it in 7697. 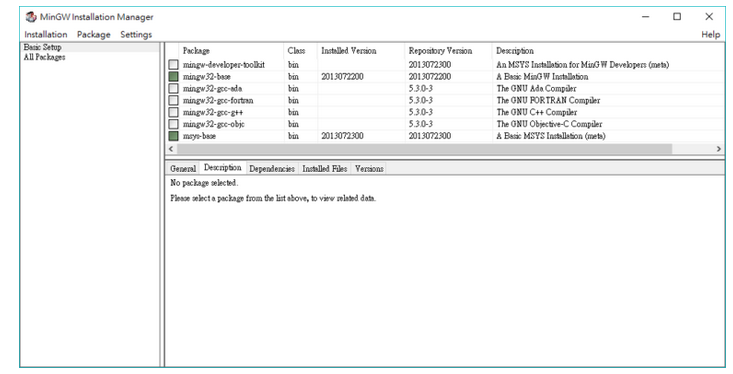 1.click this link (https://sourceforge.net/projects/mingw/files/Installer/mingw-get-setup.exe/download) to download and install the MinGW, oopen"MinGW Installer", from the"Basic Setup"project right"mingw32-base"and"msys-base", click"Mark for installation", click the upper left corner of the menu""Apply Changes"in"Installation"Changes"
3.If you are using MinGW, please download the linked file, extract the original folder renamed” gcc-arm-none-eabi-4_8-2014q3-20140805-win32” to “gcc-arm-none-eabi”, “sdk_root \ Tools \ gcc “path to create a new folder” win”, and posted “gcc-arm-none-eabi” on the “win” path, after the completion of the following path should have this file ...” \ sdk_root \ tools \ gcc \ win \ gcc-arm-none -eabi \ bin \ arm-none-eabi-gcc.exe”. After entering this path, Input “ make”, and if you run out of “Done” at last, it means that the compilation is completed. 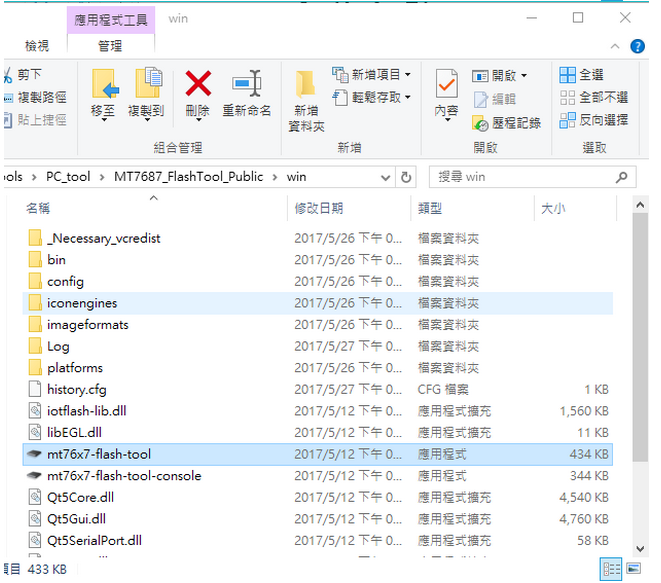 After the completion of compilering ,it will generate a folder “build ”, which is called flash_download.ini file is that we have to use other applications to write 7697 binary file, write the method as the following steps. 1. 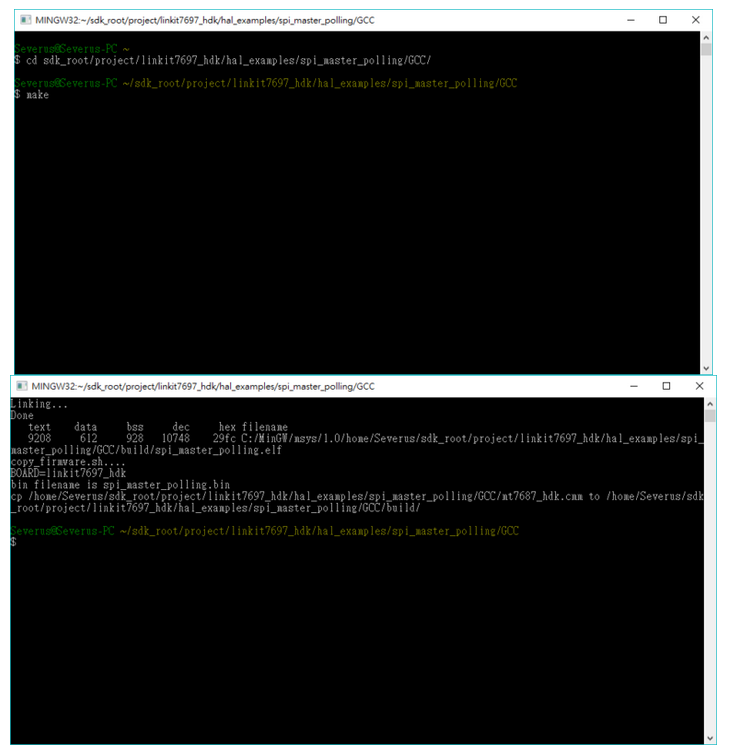 Click here( ),Download the Blink sample code and unzip it . 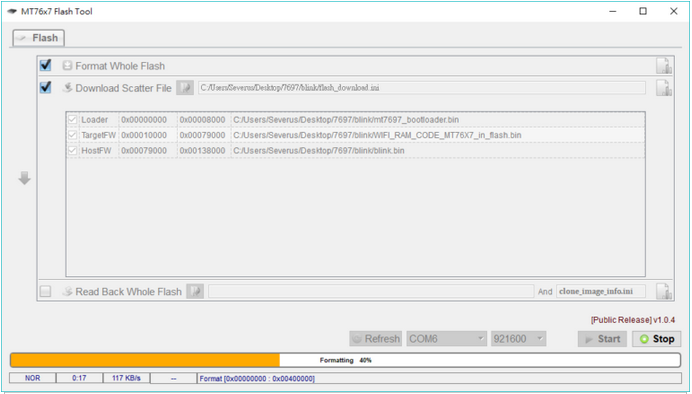 2.Click here( ), Download the Flash Tool tool and unzip it , or extract the PC_tool.zip from the LinkIt SDK path: sdk_root \ tools \ PC_tool.zip to produce the MT7687_FlashTool_Public folder with the mt76x7-flash-tool. We need to use this program. 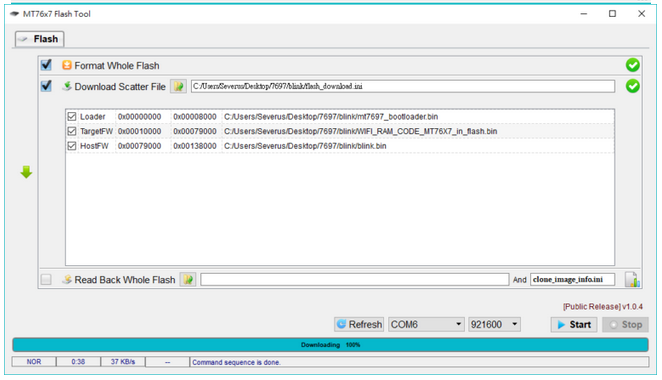 3.Connect the computer and 7697, click"Refresh"to confirm the Flash Tool Com set to the same with the Silicon Labs CP210x ... Bridge Com, we can call the device administrator to confirm the Bridge Com. 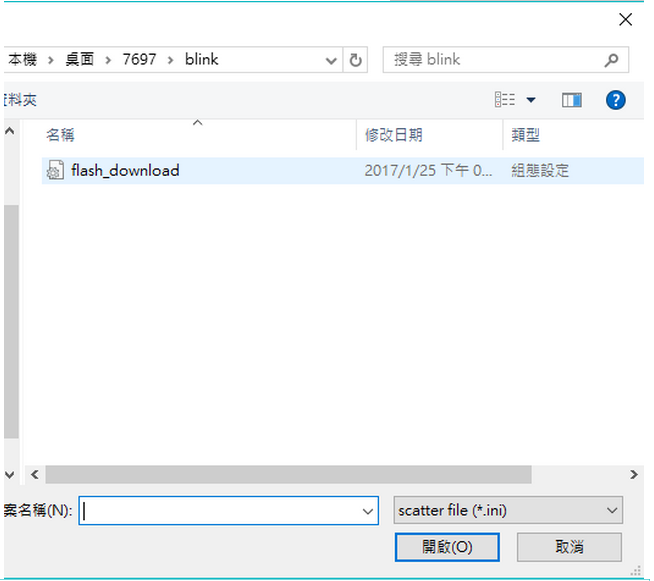 4. click"Open Folder", click the Blink folder inside the"flash_download.ini", after pressing OK ,the confirmation screen should be"Loader","TargetFW","HostFW"three projects, tick the two options ,"Format"and"whole flash Download Scatter File". 5-1.LinkIt 7697 two buttons as shown below, first press and hold two buttons at the same time. 5-2. 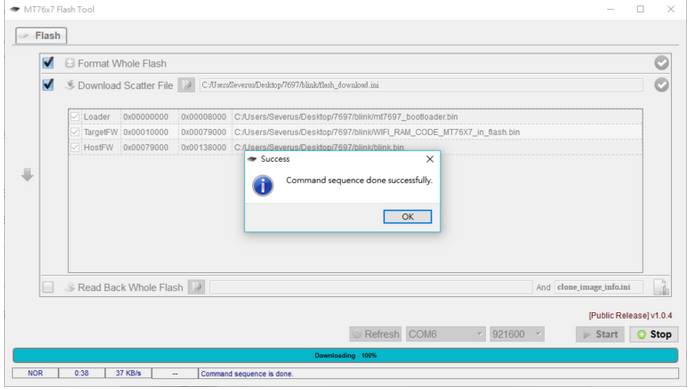 Release the RST button (USR), press the Flash Tool's Start, and if the lower progress bar shows Download ATED, the USR button can be released ,The message”Command sequence done successfully” indicates that it was successful. 5-3. 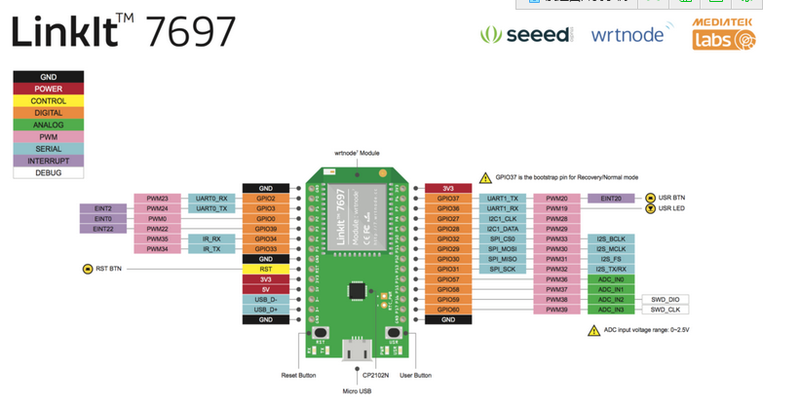 After pressing RST, the 7697 will begin to read and use the binary file we wrote, and if the 7697 LED starts flashing, it means writing is successful.